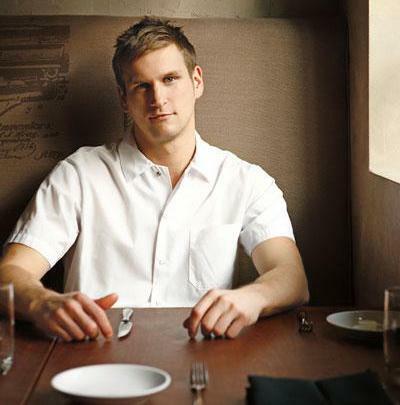 Chef Jason Cichonski is Philadelphia’s brightest rising star chefs. His artful American restaurant, Ela (627 South 3rd Street) is located in Queen Village, and is amazing! Ela’s menu changes frequently throughout the year, to reflect the season’s finest ingredients and Chef Cichonski’s creative, boundary-pushing presentations. Ela has garnered praise and a “Three Bells: Excellent” review by Craig LaBan. Jason Cichonski served as executive chef of Lacroix at the Rittenhouse Hotel when he was just 24 years old. Lacroix was one of the city’s only “Four Bells: Superior” fine dining restaurants at the time. Jason’s cooking quickly impressed many peers and food enthusiast alike. Before his success at Lacroix, Chef Cichonski worked in other highly praised kitchens, including the Pluckemin Inn in Bedminster, NJ and Moonlight, a progressive American restaurant in New Hope, PA.
Born and raised in Pennsylvania’s Bucks County, Chef Cichonski is a graduate of University City’s The Restaurant School at Walnut Hill College. Today, he resides in Philadelphia & can nearly always be found in the kitchen at Ela…but not on March 9th! Chef Cichonski will be joining us for the first time on the judge’s panel as he takes on 25 types of chilis. This entry was posted on Tuesday, February 19th, 2013 at 3:03 pm	and tagged with chili bowl, competition, craig laban, Judges, lacroix at the rittenhouse, restaurants, Where to Eat and posted in Judges, Philly Chili Bowls. You can follow any responses to this entry through the RSS 2.0 feed.